On October 4, Tim Cook has launched the new iPhone 4S and, despite the wave of rumors that preceded the event, almost everything was wrong. With a design identical to the previous version, iPhone 4S is one of the most beautiful phones on the market. This new Apple product offers little more glamour, the design has that flavor with classic sophistication and minimalism “Made in Cupertino”. Aluminum frame, which is the basic structure for housing reinforcing and antenna assembly, is the only one to distinguish the two terminals. From the previous model, which implemented the messy dish with two segments, iPhone 4S provides a set of antennas composed of four segments. The second clue is the button for Silent/Vibration, which was lowered a few millimeters because of the new antenna design. Quite heavy at its 140 grams because of the aluminum combination and glass or sizes too big for a phone with a screen of 3.5″, 115.2 x 58.6 x 9.3mm, iPhone 4S fits perfectly in hand. The design is minimalist: the right of the frame offers only the Micro-SIM slot, while on the right you can find the volume and Silent/Vibration buttons. At the top is set an RTTS 3.5 mm audio connector, microphone noise cancelation and secondary Power/Lock button, while the bottom provides the main microphone, speaker and power connector. The front offers a VGA camera, speakerphone for calls and the only hardware button, all hidden under the glass sheet of the case, while the back houses the camera lens and LED flash. As usual, the objective is not protected, all we can hope is that the resistant glass and tiny aluminum frame around it, offering a tiny bump to avoid direct contact area will be sufficient. Drawing the line in this chapter, iPhone 4S is reliable in terms of construction and ergonomic, with its elegant yet discreet appearance bonus. 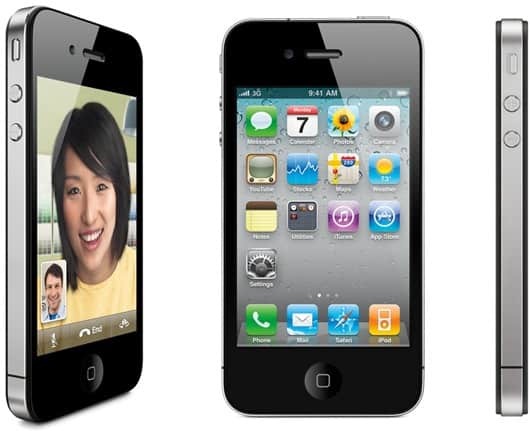 Like its predecessor, the iPhone 4S provides a screen diagonal of 3.5″ with IPS panel and LED lighting. The phone cannot fight with the ones that have AMOLED panel, which offers a perfect black level and contrast virtually infinite, but is very good in this regard – black level and contrast are among the best seen so far. The brightness is excellent, even if terminals such as Nokia 701 offer something more, and the colors are strong and natural. Obviously, we must not forget about the resolution of 640 x 960 pixels, so-called “Retina Display”, which raises the density at 330ppi. If iPhone 4S was not changed outside, we can see the changes in the hardware chapter. 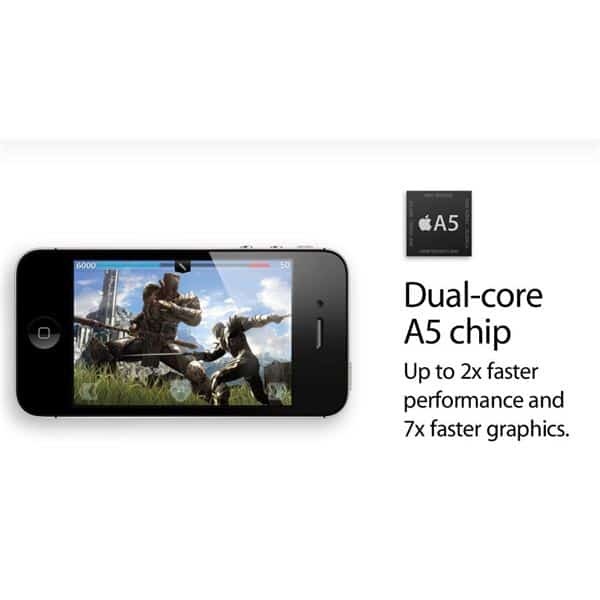 Based on Apple A5 processor, which offers dual-core ARM Cortex-A9 cores and PowerVR SGX graphics 543MP2 processor, iPhone 4S is clocked at 800MHz. When it comes to graphics power, iPhone 4S practically shattered his predecessor, being definitely the fastest mobile phone of the moment. With the right SIM Only offer, you could easily connect to the internet with the fastest speed possible. Games that use this power has yet to appear, but as GLBenchmark synthetic tests, the graphic processor unquestionably defeat its rivals like ARM Mali-400mp, NVIDIA GeForce ULP and Qualcomm Adreno 220.
iPhone 4S includes a dual radio modem from Qualcomm, specifically MDM6610, which gives the terminal the possibility to use both GSM and CDMA networks. The Phone also supports 2G and 3G quad-band with HSDPA 14.4 Mbps and HSUPA 5.8 Mbps, wireless 802.11 b/g/n and Bluetooth 4.0. As it’s already known, the fifth version of the iOS operating system started with some problems related to autonomy. On average, a full charge gave me 8 hours of use and 30 hours standby, iOS reporting only these two modes without further details. Of these, about 4 hours were with 3G connectivity 6 hours with Wi-Fi connection and the standby time includes about 2 hours of audio playback. It’s a decent range, the price of a dual-core and a complex operating system must still be paid somehow. This is a guest post made by Costea, a writer that mostly writes about the top phones from the market. He is also promoting a SIM card websites that offers the best SIM Only Deals.